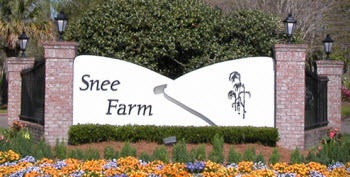 Long before developments such as Park West, I'on and Brickyard appeared, Snee Farm was considered to be one of the most desirable places in Mount Pleasant to live. It is an established, tree-lined community consisting of a variety of homes that range in size from 1,000 square feet to more than 4,000 square feet. Ventura Villas is a neighborhood of condominiums situated near the main entrance of the community and convenient to the clubhouse and golf course. The exteriors are clean and modern and the interiors are spacious. Prices tend to be in the upper $100s to low $200s for two- and three-bedroom homes.